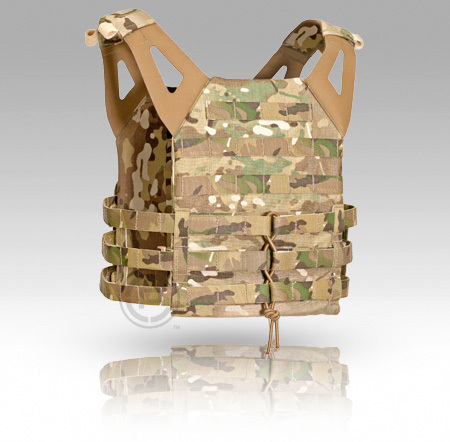 A new lightweight and minimalist approach towards protection and load-bearing solutions. Unsurpassed weight savings and packability at just over 1 lb. for the entire carrier. 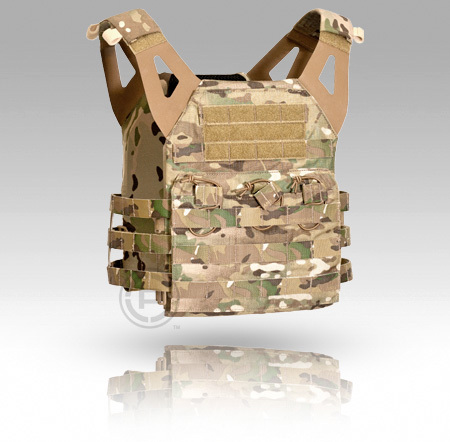 The JPC offers a wide variety of configuration options, from completely slicked down to fully loaded out with side plates and Crye's revolutionary new AirLite cummerbund that features their patent pending integrated attachment system. This allows pouches to be mounted on both the inside and outside of the cummerbund and sheds unnecessary weight and bulk while improving ventilation. Patents Pending. 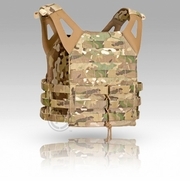 AirLite and JPC are trademarks of Crye Precision LLC. Note: if your plates are more than 0.75 inches thick, you may need the next larger size to fit the armor (shoulders and cummerbund have wide adjustment range).